Pechory is a town in Pskov Oblast, Russia. According to the 2002 population census, the town had 13,056 citizens, including a few hundred ethnic Estonians. Pechory is a town in Pskov Oblast, Russia. According to the 2002 population census, the town had 13,056 citizens, including a few hundred ethnic Estonians. 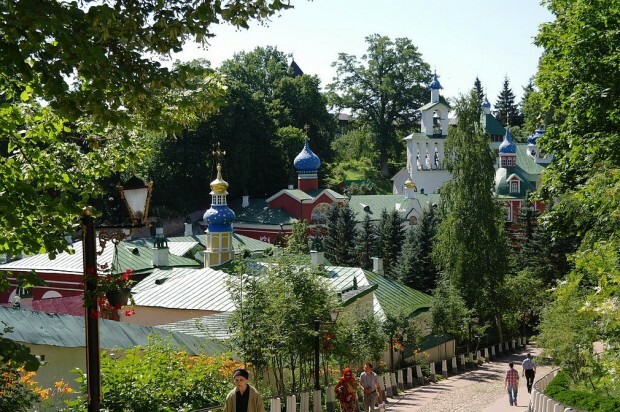 The town of Pechory was founded as a posad near a famous Pskovo-Pechersky Monastery in the 16th century and soon developed into an important trading place. During the reign of Ivan the Terrible, Pechory was an important border stronghold. It was besieged numerous times by Russia’s enemies: Stefan Batory’s forces sacked the settlement during the Siege of Pskov (1581); the Swedes or the Polish stormed Pechory in 1592, 1611, 1615, 1630, and from 1655 to 1657. After the Great Northern War broke off, Russians renovated the fortifications and Boris Sheremetev began his campaign of 1701 in Pechory. In the 20th century, the settlement that had been in oblivion for centuries, regained its status as a town (1918). From February to December 1918, Pechory was occupied by the Germans. During the Estonian War of Independence, the town was included with the Estonian territories on March 29, 1919. On the grounds of the Tartu Peace Treaty, Pechory and the territory around it, called Setomaa, were given to Estonia. During the inter-war years, Petseri, as it was called at that time, was the centre of Petserimaa (Petseri County), one of the eleven counties that made up the Republic of Estonia. The St. Peter’s Lutheran Church was built in 1926. During World War II the town was occupied by the German Army from August 1941 until August 11, 1944. In 1945, after Estonia was occupied by the Soviet Union, Pechory and most of Petseri county were transferred unilaterally to Pskov Oblast of the RSFSR. The territory has remained under Russian control ever since. In 1956, Pechory Secondary School No. 2 was opened for Estonian-speaking pupils. After the indipendance in 1991, the town and the territory around it are still claimed from Estonia on the ground of Tartu Peace Treaty, in which Russian promised to not expect territory from Estonian anymore. Estonian Painter Alfred Hirv was a native of Pechory — Petseri, as were writer Lilli Promet and footballer Jaanus Sirel. Pskovo-Pechersky Monastery or The Pskovo-Pechersky Dormition Monastery or Pskov-Caves Dormition Monastery is a Russian Orthodox male monastery, located in Pechory, Pskov Oblast in Russia, just a few kilometers from the Estonian border. The monastery was founded in the mid-15th century, when the first hermits settled in local caves. The first cave Church of the Dormition of the Theotokos was built in 1473 (its modern facade was constructed in the 18th century). After the monastery had been destroyed by the Livonian feudals, it was rebuilt by a Pskovian dyak Mikhail Munekhin-Misyur in 1519. A posad (settlement) was built next to the monastery, which would later grow into a town. In 1550s-1560s, Pskovo-Pechorsky Monastery and its posad were surrounded by a wall with towers (eventually, these fortifications were rebuilt in 1701). 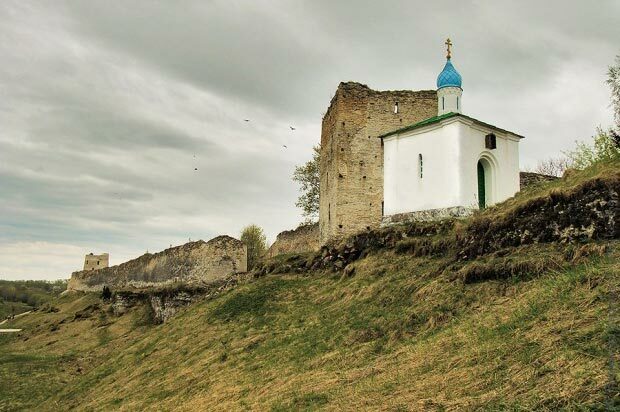 The monastery became an important outpost for defending the western border of Russia. In 1581–1582,it withstood the siege laid by Stefan Batory’s army. In 1611–1616,the monastery repelled the attack of the Polish army led by Jan Karol Chodkiewicz and Aleksander Józef Lisowski and Swedish army led by Gustav II Adolf. Pskovo-Pechersky Monastery lost its importance after the Great Northern War of 1700–1721.In 2003 the monastery marked the 530th anniversary of its existence. Izborsk is a rural locality (village) in Pechorsky District of Pskov Oblast, Russia. It contains one of the most ancient and impressive fortresses of Western Russia. The village lies thirty kilometers to the west of Pskov and just to the east of the Estonian border. According to the Russian Primary Chronicle, the town was the seat of Rurik’s brother Truvor from862-864.Although his burial mound is still shown to occasional tourists, archaeological excavations of long barrows abounding in the vicinity did not reveal the presence of the Varangian settlement at the site, indicating that Izborsk was an important centre of the early Krivichs. The next mention of the town in Slavonic chronicles dates back to 1233, when the place was captured by the Livonian Brothers of the Sword. Pskov moved the fortress to a more convenient site in 1302. The most ancient extant structure is the Tower Lukovka (literally, «Onion Tower»), constructed in 1330. At that time it was the only stone building west of Pskov and adjoined a wooden wall. After seven other stone towers and the new stone wall were completed, Lukovka became a watch-tower. The Nativity church within the fortress was built in the 16th century. Near the fortress is a museum of stone crosses. According to the Treaty of Tartu, the Russian-Estonian state boundary went eastwards of Izborsk and thus the town was part of Estonia from 1920 to early 1945 when, both Russia and Estonia being part of Soviet Union, the Russian SFSR/Estonian SSR boundary was moved westwards and thus Izborsk became part of Russian SFSR. Setos (setoq) are an autochthonous ethnic and linguistic minority in south-eastern Estonia and north-western Russia. Setos are mostly Seto-speaking Orthodox Christians of Estonian nationality. 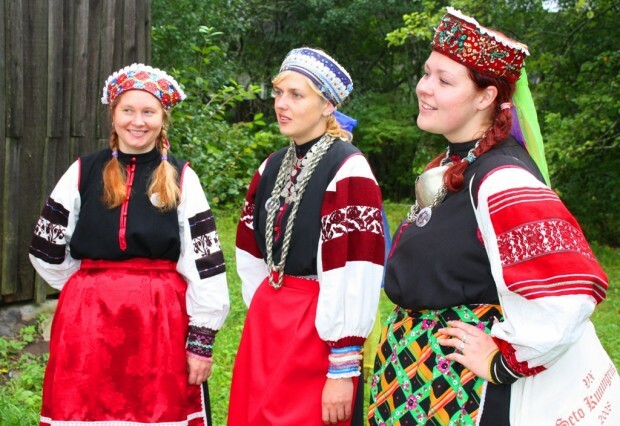 Their dialect, that some consider an independent language — the Seto language (like Finnish and Estonian) belongs to the Balto-Finnic group of the Finno-Ugric languages. The Setos seek greater recognition, rather than having their language considered a dialect of Estonian. Along with Orthodox Christianity, vernacular traditional folk religion is widely practiced and supported by Setos. There are approximately 10,000 Setos all around the world. The bulk of Setos, however, are found in the Seto region (Seto: Setomaa), which is divided between south-eastern Estonia (Põlva and Võro counties) and north-western Russian Federation (Pechory, Pskov Oblast). Setos are an officially protected ethnic minority of Pskov Oblast.